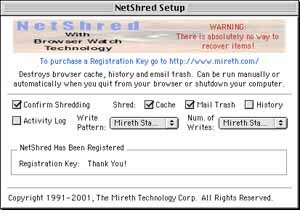 Clear cache, erase history permanently with NetShred, the easy-to-use internet track eraser for Mac OS 8 / OS 9 that erases files your browser and email programs leave behind. NetShred is the internet privacy software that is easy, fast and cleaner. Easy because it runs automatically - you don't have to remember to use it. Fast because you don't have to wait for it. Cleaner because it will erase, not just delete cache, history and trash. ...... Mac OS 8/9. Your web browser stores copies of the images and text that you see in on your hard drive. Anyone with access to your computer can look through these files and see what information you have accessed on the web. These internet tracks - browser cache, history, download cache and email trash - not only potentially compromise your privacy, they also take up a lot of disk space. Clearing your cache, throwing these files in the trash, or deleting them will not remove the file contents from the hard disk - it just removes the file name from the directory, leaving the data intact and recoverable. To dispose of these internet tracks, use an internet track eraser to erase them so they CAN'T be recovered. Qweas is providing links to NetShred 2.1 as a courtesy, and makes no representations regarding NetShred or any other applications or any information related thereto. Any questions, complaints or claims regarding this application NetShred 2.1 must be directed to the appropriate software vendor. You may click the publisher link of NetShred on the top of this page to get more details about the vendor.